Trader Joe’s is a remarkably successful grocery store chain that as of October 28, 2016, had 460 stores with half in California (the most located in Southern California), and the rest in 40 other states and Washington D.C.. The original Trader Joe’s was opened 49 years ago in Pasadena by Joe Coulombe and named Trader Joe’s to evoke images of the South Seas. Today, it is owned by Germany’s Albrecht family. Total sales in 2009 were roughly $8 billion, about the same as the Whole Foods grocery chain and was number 314 on Fortune 500 list. Wine was originally a major part of the store’s inventory and at one time his store had one of the world’s largest stock of California wines. I can remember back in the 1970s when Trader Joe’s had a store in Santa Ana, California. The wine department occupied a significant part of the store and many wine aficionados, including myself, shopped there regularly for California wine because of the large selection and reasonable prices. 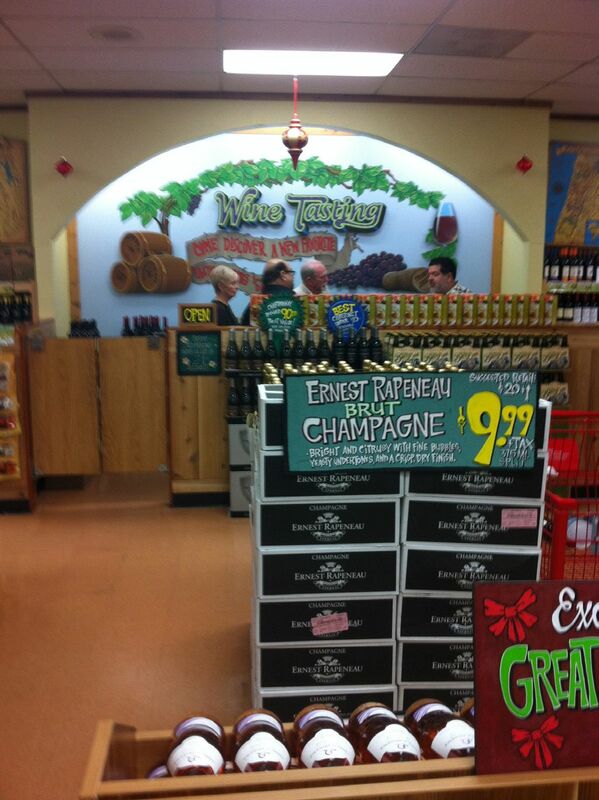 Today, there is a wine department in each store with an extensive collection of domestic and foreign wines, wine tasting bars in some stores (see photo below of store in Costa Mesa, CA), and even a free standing Trader Joe’s Wine Shop in New York’s Union Square adjacent a Trader Joe’s Market that is very busy according to Yelp. There are still some mass market wines from well-known wineries offered in the wine department at Trader Joe’s, but these are usually more expensive, making Trader Joe’s own labels seem like better deals. The biggest selling wine by far at Trader Joe’s is Charles Shaw, produced by Bronco Wine in California, with sales over 800 million bottles since it debuted at $1.99 in 2002. Trader Joe’s is the exclusive seller of the Charles Shaw line of varietals (no Pinot Noir) that have become known as “Two-Buck Chuck.” The wines are no longer priced at less than two dollars, but are still priced below three dollars a bottle. Beyond the Charles Shaw wines, that are displayed in case boxes for easy case purchase and take out, and in keeping with the store’s emphasis on its own brand names, many of the wines that are now stocked are offered under Trader Joe’s own label or private labels with fetching names. Trader Joe’s is a négociant that buys wine someone else makes and sells it under its own label. The wine may be declassified by the winery as not meeting their highest standards, it may be excessive wine production in a certain vintage, or it may have been produced in a manner directed by the négociant for the private label purpose. These private label wines are sold at a significant discount as they are obtained directly from wineries without a middle distributor. Some examples of private label Pinot Noir at Trader Joes are Cherry Blossom California Pinot Noir ($3.99, produced by Bronco Wines), Liberté San Louis Obispo County Pinot Noir ($9.99, Malbec and Syrah added), Moon X Black California Pinot Noir ($6.99), Cotillion Tri-County California Pinot Noir ($9.99), Green Fin California Pinot Noir ($4.99) and VINTJS Willamette Valley Pinot Noir ($8.99). There are also Pinot Noirs bottled under the Trader Joe’s name. These wines often carry designations such as “Reserve,” Petite Reserve,” “Grand Reserve,” and “Platinum Reserve,” with Platinum Reserve being the top of the line and the most expensive at about $15. Reserve, of course, is an unregulated term that has no legal definition and is essentially meaningless. Like all products in the store offered under Trader Joe’s proprietary labels, the producer of the Trader Joe’s private label wines is not allowed to publicize its business relationship. As pointed out in a Fortune magazine article, www.fortune.com/2010/08/23/inside-the-secret-world-of-trader-joes/, Trader Joe’s is secretive about its products including wine. The Albrecht family has never given a major story about their business, and Trader Joe’s does not want its shoppers or competitors to know who makes their products. Labels are in important in choosing wine as the more information you can gather, the better your odds of finding a good wine at a good price. The problem is, the labels on Trader Joe’s wines offer little useful information other than the region or appellation of origin, the ABV and occasionally the case production. The back label may offer the words, “Vinted and bottled by,” and the name of a producer that usually has no physical facility and means that the producer or winery on the label had little or nothing to do with making the wine. “Produced and bottled by”: By law, 75% or more of the wine in the bottle must be made (fermented) by the producer listed on the label at the stated address. “Made and bottled by”: At least 75% of the wine has been made (fermented by) the winery listed on the label at the stated address. “Vinted and bottled by”: The winery on the label may have had very little to do with making the wine at the stated address. “Bottled by”: The company listed on the label did not make the wine and only bottled it at the stated address. “Estate grown”: The winery controls all the grape growing on its land but does not ferment or bottle on its property. Here is some advice regarding purchases of Trader Joe’s Pinot Noir (applies to other varietals as well). (1) The Trader Joe’s labeled wines may carry a “Lot #” designation. You must pay close attention to this number when you are repurchasing a wine you liked as the Lot # will change with each vintage and there may be multiple lots of the same appellation Pinot Noir within a vintage. (2) The selection of wines varies from store to store. (3) If you find a wine you like, it is advisable to repurchase it soon as stock changes on the private labeled wines frequently. (4) You won’t find scores on any of the wines, only brief descriptions of the flavor profile on shelf tags. The wines are not submitted for review or reviewed in any of the major wine publications. (5) Don’t even think about any Pinot Noir priced less than $9.99 unless you need something to serve relatives who know nothing about wine. The cheaper wines often have generous oak overlay in place of fruit quality. (6) The Trader Joe’s private label wines are hit or miss. By that, I mean you will be frequently disappointed, but you may occasionally find a good or even very good Pinot Noir in the $9.99 - $14.99 range. 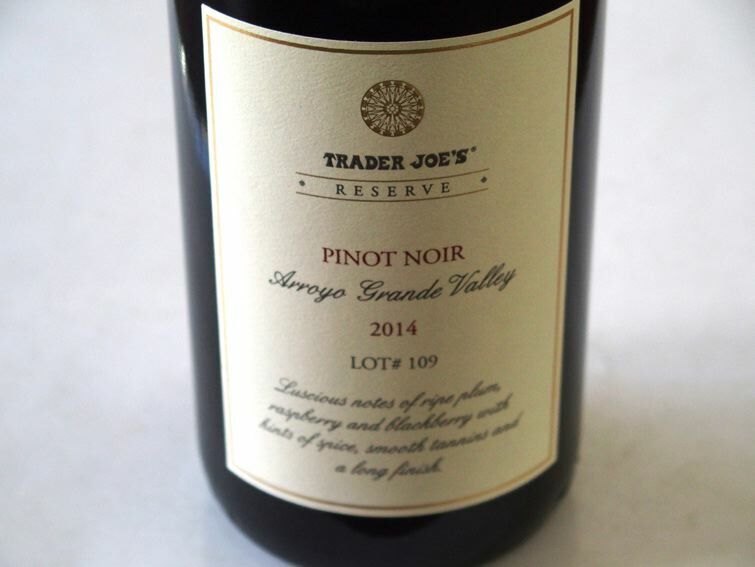 None of the private label Pinot Noirs can match up with premium Pinot Noir produced by so many domestic wineries, with most Trader Joe’s Pinot Noirs falling in the “Good” (80-85 score) category, and occasionally “Very Good” (86-89 score) range. Most often, the Pinot Noirs bottled under the Trader Joe’s name have the best chance of pleasing you, particularly the ones priced at $14.99. I would use the term “innocuous” or “quaffable” for the Pinot Noirs and this is a credit to their QPR ratio. 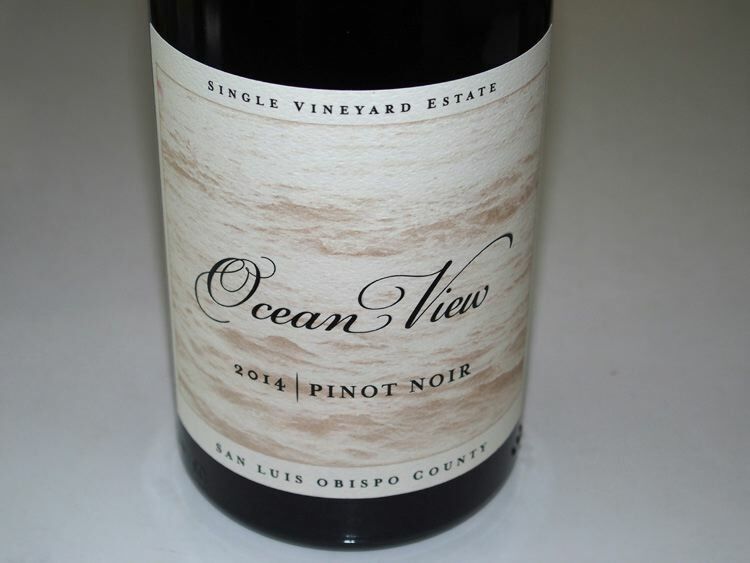 (7) The best private label Pinot Noirs are on the first or second shelf in the wine department racks. (8) Information on Trader Joe’s Pinot Noirs is hard to come by. Online there is the Trader Joe’s Wine Insider at www.traderjoes.com/digin/category/WineInsider where a few wines are reviewed but only reflect a typical retailer’s enthusiasm for every wine. Those on the Trader Joe’s mailing list, can receive the monthly Fearless Flyer that also features a description of select wines. This is also available online at www.traderjoes.com/fearless-flyer/category/11. There are also wine blogs such as Trader Joe’s Wine Compendium at www.traderjoeswine.blogspot.com. You will not find in-depth information about any of the Trader Joe’s private label wines from any source. That may not be important to you if you are only spending $10 for a quaffable Pinot Noir. Here are reviews of six private label Trader Joe’s Pinot Noirs that I bought at my local store (Tustin, CA) in the past two weeks. 2014 Cotillion California Pinot Noir 13.8% alc., $9.99. Vinted and bottled by Ashford Court, Napa, CA. 85. 2014 Sphere Monterey County Pinot Noir 13.8% alc., $6.99. Said to be crafted by “a winemaker with deep roots in California wine country.” 87. 2014 Trader Joe’s Grand Reserve Lot #57 Russian River Valley Pinot Noir 14.2% alc., $14.99. Cellared and bottled by DNA Vineyards, Ukiah, CA. 88. The best Trader Joe’s private label Pinot Noir I have tasted in the past two years is one I reviewed in April of this year. It is still available at Trader Joe’s.